This painting shows a group of people in one of the famous bars in Berlin. The Newton Bar. The people on the right side were from NYC. The focus in this work is on details, e.g. the beverages, the fruits, the bag but also the mood, expression in the faces character and habit. 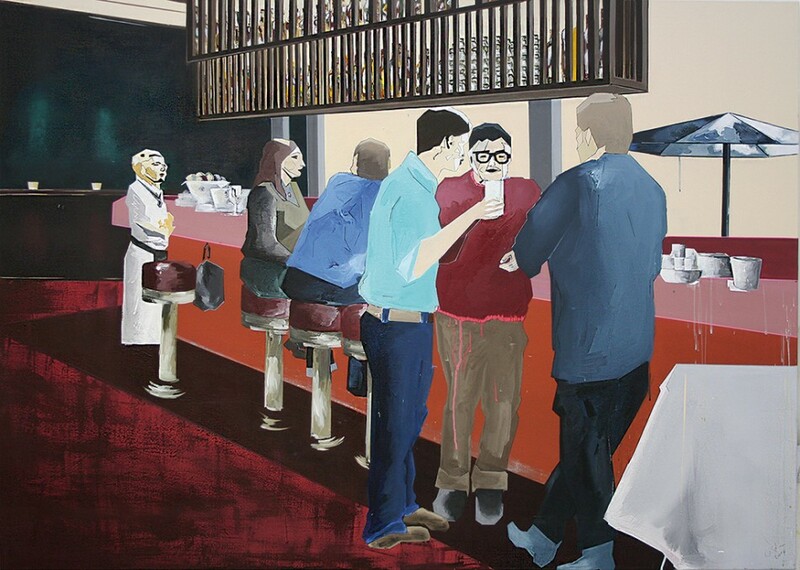 While the tension in the painting starts from the group in front of the right side (dynamicly) it went to the waitress at the end of the bar (silently). She is also the main figure and the most important detail. "The Bar" is one piece of work from 2015. This piece has been showing in many exhibitions in Germany and outside. Signature: This single, original piecee is hand signed by Dikla Stern. You cannot comment unless you are logged in.